Continental Tires to use Dandelion Rubber for Tire Production? Remember those bright yellow lawn killers that at first-look seem like flowers but are actually weeds? They can apparently be used to make rubber. Natural rubber is formed from latex, a white sticky liquid found in a number of different plant species. For quite some time we have harvested latex in bulk from Hevea brasiliensis, commonly known as the rubber tree. 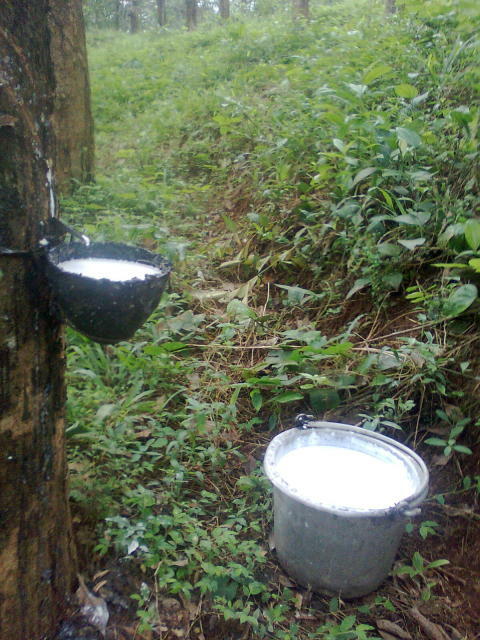 Latex is collected in buckets from tapped rubber trees. Often found in tropical climates, manipulation of the rubber tree has contributed to humanities rather large carbon footprint. In October 2013, Continental Tires and the Fraunhofer Institute for Molecular Biology and Applied Ecology IME began a joint project. This project led to the development of the first pilot system to extract vast quantities of dandelion rubber for making tires. A facility was built in Münster, Germany, to develop the natural rubber by the ton while cultivating several hectares of latex-rich Russian dandelion. Researchers simultaneously grew new varieties with a higher proportion of rubber and biomass yield. Not needing tropical climates like rubber trees, Russian dandelions can be cultivated from “marginal land,” previously unusable for agriculture. The first prototype test tires made with blends from dandelion-rubber were first shown at ContiWinterRoadShow 2014 under the name WinterContact TS 850 P.
In recognition of Earth Day, Continental Tires has announced the successful testing of natural dandelion rubber tires, using the material they call Taraxagum, derived from the botanical name for dandelions, Taraxacum. "Continental's use of dandelion roots to make rubber brings us one step closer to reaching our goal of making tire production more sustainable and less dependent on traditional raw materials,” said Dr. Peter Zmolek, Continental Tire the Americas director of research and development. Zmolek will share how Continental turns a weed into a tire during the "Sustainable Materials and Components" technical session during the SAE 2015 World Congress & Exhibition on April 21, in the Cobo Center in Detroit, MI. For more info on Continental’s Taraxagum tires, visit www.taraxagum.com.